1 on 0, 2 on 0, 3 on 0, each player goes, the team runs a lap for every miss. 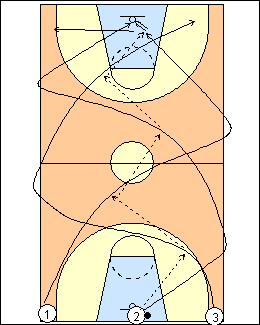 Fullcourt right-hand layups up and back, a coach in each lane rebounds and passes to the shooters. 2 will start when 1 gets to halfcourt going away. Option - a coach at centre asks the dribbler how many fingers he has up. 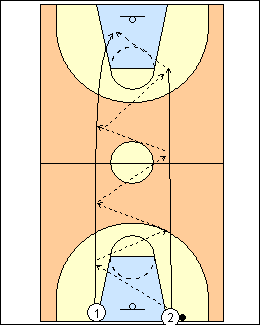 Repeat with left-hand layups on the other side. 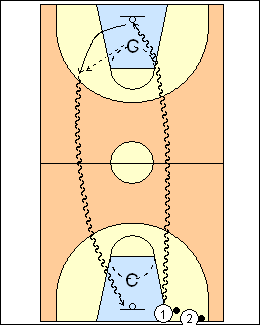 Basketball WA - fullcourt shooting - take a layup from halfcourt (max 3 dribbles), coach rebounds and passes or rolls the ball downcourt, make another layup, rebound and push the ball back with 3 dribbles to take an elbow jump shot. 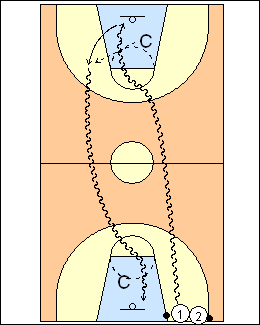 Progression - to cut off defenders in transition, make a cross-over dribble above the lane, take a left-hand lay-up. Two players pass back and forth without dribbling or travelling to score as quickly as possible. Stay at least lane width apart. The player with the ball at the foul line makes a bounce pass for the layup, and rebounds. No inbounds pass, or putback on a miss. Repeat coming back, then the next pair goes. 3-man weave up and back, touch the sideline after passing (killer weave). The shooter and last passer cross and get wide, the 3rd player rebounds.